Organising one successful participatory budgeting event is impressive enough. In January 2016, South Lanarkshire Council and partners organised PB events in four locations in South Lanarkshire which took place across two days. The events allowed local people to decide how best to spend money on facilities and activities for young people. PB Scotland was delighted to attend one of the events, on Thursday 21st January in Springhall Community Centre, and spoke to participants, projects and organisers taking part. Anne Hopkins-Simpson, Development Officer at South Lanarkshire Council's Tackling Poverty Team explained that the decision-making events, entitled My Vote, My Community, came under the banner of "Building Communities from the Inside Out", an ongoing targeted community capacity programme supported by South Lanarkshire Council. Partners behind the initiative, which included Regen:fx Youth Trust, Universal Connections, Healthy & Happy Community Development Trust and Community Links South Lanarkshire, agreed that PB was a meaningful process that would promote participatory democracy. Not only would it allow the community to decide how money is spent on local projects, but the process involved local people helping to design and develop the project ideas. Initially, the Council had managed to identify £36,000 to put into PB, with contributions coming from the Community Planning Partnership Community Safety and a small scale environmental project called Pride Of Place. This was then doubled with match funding from the Scottish Government to give a total pot of £72,000. Money had been made available to encourage local people to work together to develop and deliver project ideas that would make the community a better and safer place for children and young people. The Springhall event was run in conjunction with an event in neighbouring Whitlawburn, with ten projects to vote for across the two areas. These ranged from renovating the Cage, a sport and recreational area for young people, to funding an intergenerational family fun day. Some proposals concentrated on continued funding for pre-established groups, such as Spartans Football Club which provides football opportunities to young people, whereas some were entirely new ideas. Many of the proposed projects were developed with young people and the wider community. For instance, Healthy & Happy consulted with local people on what they thought would improve the area. Julie, a volunteer at Healthy & Happy as well as the youth club in Springhall, explained that community members had wanted to see the Cage regenerated for a long time, as it was currently an eye sore. Once it was agreed that renovating the facility was a priority, Healthy & Happy worked with the community to plan how it might be improved, including resurfacing area and lining it for a whole range of sports activities. Doors opened at 1pm and voting stopped at 7pm to ensure that as many people as possible could take part, covering the local school run and local youth club times. Groups and organisations offered information on their project via a market place with stalls and displays providing information on the projects and how they would benefit young people and the local community. Participants of all ages received ten stickers and placed them against their preferred options, before posting in a voting box. This allowed people to either spread their votes across a range of projects or to concentrate on supporting a smaller number of ideas. Votes were counted immediately after the event ended, and the participants and projects were informed of the result on Monday the 25th of January. A constant stream of people of different generations came through the door to vote. People were evidently impressed by the event and keen to take part. Most people PB Scotland spoke to said they had not been involved in any decision making processes aside from voting in elections and that this was an entirely new experience – one they would welcome again in future. There were also good turnouts at the two other local PB events that were held over the two days. In Burnhill, 84 people voted, funding four projects. A further 78 people voted in Westburn, funding six projects. Much of the success of the PB event can be attributed to careful planning and organisation. The location and timing of the event was ideal, as the weekly youth club is clearly a well-attended and well-regarded service. Some participants stated that they would have turned up anyway, yet felt that the PB event had certainly made the place much busier. On this note, the partners had done a great job promoting the event, with volunteers and young people distributing flyers around schools, homes and local businesses. One woman found out about the event after discovering a flyer left under her car windscreen wiper. Regen:fx Youth Trust which works with young people across South Lanarkshire and also helps deliver many of the youth activities in Springhall and Whitlawburn, played a significant role supporting young volunteers to promote the event by distributing flyers. Youth Development Worker, Heather Robertson gives her view of the event in the video below. The benefits of the PB process were very much on display, as the afternoon was a real hubbub of activity with a steady stream of people coming through the door. Volunteers from two different projects told PB Scotland that they initially would have preferred to divide up any available money equally between interested projects. Having taken part, they reflected that PB was an effective way of raising awareness of local initiatives and how they are funded. “People turned up who didn’t know there was a local football team. I’ve seen things fall flat on their face but this is a really good turn out” Alison Black, Club Secretary, Spartans Football Club. 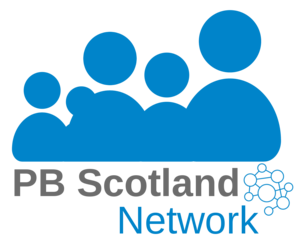 This is the first of a series of PB events PB Scotland will be attending around Scotland, capturing the energy and learning at each event through a range of media, including photos, videos and interviews. More event write ups will be added soon. Get in touch if you are organising a local PB event that you would like us to cover.